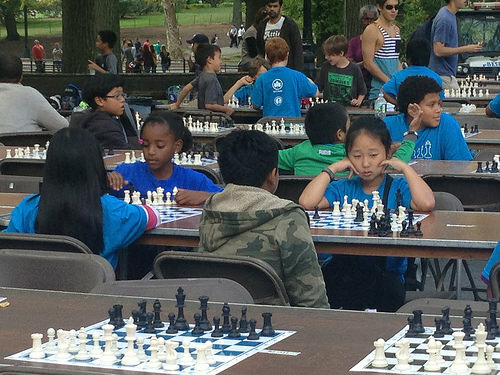 Nearly 700 chess tournament players flaunted their brain power at Central Park yesterday as part of an emerging citywide love for the game. The 14th Annual Chess-in-the-Park Rapid Open tournament was open to people of all ages and skill levels, who were equally puzzled and intrigued by the game. The players held classic thinking poses, fist to jaw and hand on temple. Suddenly, a piece would move forward, followed by a hit on the clock, a satisfied smile, a two-minute break, then all was repeated. This brain fiesta was arranged by a nonprofit organization Chess-in-the-Schools, who believes chess is an important knowledge that can help kids to achieve their goals in the future. The program is in all five boroughs in Title I schools, where more than 60% of the students are eligible for the free or reduced cost federal lunch program. In 1986, the American Chess Foundation started teaching chess in schools. Since then, the magic of moving pieces opened to more than 400,000 students in New York City public schools. 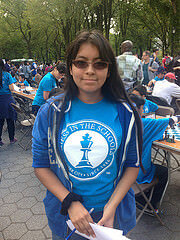 In 1997, the focus had shifted completely and the name of the program changed to Chess-in-the-Schools. Kids of all ages can enroll free of charge. Teacher-training programs support any inspired teacher to bring the program to their school. They will learn how to play and teach, plus are given the chess equipment. And the movement grows every day. The main goal is to reach the majority of schools in New York.